It has been nearly a month since my facelift, and I feel beautiful! I can hardly stop looking at myself in the mirror. My friends and family are amazed by how healthy and natural I look. I was recently mistaken for my daughter's sister. The surgery was a breeze I had managed to work myself into an anxious mess in anticipation of the process-quite unnecessary. Dr Dheeraj Bojwani was great during my time of mind numbing fear and even gave me his cell phone number. Right from the very first phone call when i was researching for this facelift surgery, I felt that you were able to answer my questions and understood our concerns. His follow-up is exemplary. I was treated with the greatest of care and professionalism by the entire staff. Dr. Dheeraj Bojwani made me feel very comfortable about the surgery and as busy as we know you are, you took the time to make sure I completely understand the entire procedure. I am extremely pleased with the outcome and cannot thank you enough for the wonderful job done! Choosing Forerunners Healthcare Consultants was the best decision I could have made. From my initial contact I knew we had chosen the right company to travel with. After receiving the details and cost quote from IndianMedGuru Consultants in India on cosmetic to my face- a facelift surgery, , I decided to get my surgery performed abroad by a USA trained cosmetic plastic surgeon in India, the surgery tour facilitated by Dr. Dheeraj Bojwani Consultants at very affordable costs. Dr. Dheeraj Bojwani called up several times in Sydney to discuss my plans and procedures and even set up a direct link with my performing surgeon. All very professional and re- assuring, especially as I had never traveled so far from Australia I had a wonderful experience, The staff very accommodating and the daily visits by the Forerunners Healthcare Consultants team also brought us a lot of peace of mind and were great company whilst in hospital. The facelift surgery went off successfully and I am more comfortable now then in the last 6 years or so. Should have done this year ago. I feel a good 20 years younger. I thank Dr. Dheeraj Bojwani Consultants for every thing, all the arrangements- linking me up with the best surgeon, providing the best hospital care by kind and caring professional staff, air tickets, airport pick up and drop off, transfers, cell phone, shopping and a one day tour to one of the wonders of the world- the fascinating TAJ MAHAL at Agra. My health tour experience was so good that I am sure I’ll be back soon to explore India and its diverse culture very well. Keep up the great work and we hope you continue healing the world! At first I was skeptical about having facelift surgery in India, but surprisingly enough the health care services were excellent. On my arrival to the International Airport in Mumbai , I was met and greeted by a Dr. Dheeraj Bojwani Consultants representative.. I was driven to my pre-arranged hotel in a luxury SUV. The hospital was beautiful In my experience, it was equal to the best hospitals in the U.S. Everyone at the hospital from the cashiers to the housekeepers to the nurses and doctors spoke good English and made me feel right at home At the hospital the rooms were not only air conditioned, they were also VERY clean. I preferred to stay at the hospital during my entire stay, and it was a very nice experience. All the services, staff, and physicians were absolutely great, and they all provided a special touch of personal care. I enjoyed my recovery time watching cable TV with my favorite English language international channels, sleeping, reading and eating. A Dr. Dheeraj Bojwani Consultants representative visited me everyday during my stay at the hospital and the hotel to ensure that I was comfortable This time to relax was important for me. I would definitely recommend traveling to India for surgery it's cheaper and the results are brilliant. I was always in touch with my family and friends back home through the cell phones provided by Dr. Dheeraj Bojwani Consultants, they also arranged for an escorted tour to local markets, a handicrafts bazaar and modern malls. I am very confident of the excellent quality of healthcare in India and would not hesitate to have more procedures completed there. 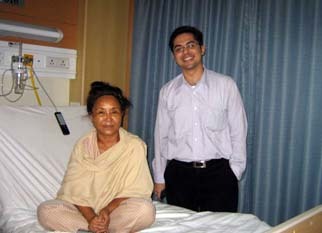 I highly recommend the affordable the medical surgery treatment packages available through IndianMedGuru Consultants. I have plan on coming back soon to have jaw surgery Thank you Dr Dheeraj Bojwani and Dr. Dheeraj Bojwani Consultants..